Saturday was such a dreary, stormy day here, which was not very agreeable with me wanting to grill outside. I had bought some petite sirloin steaks on sale that day and wanted to try them. Since my husband and I ended up being the only ones here to eat, I pan fried our steaks and made easy sides so there was very little clean up. I'm only sorry that the picture is not very good. My husband was wanting to eat, so I hurriedly took photos, hoping one would be good. They weren't. But the steak was very good. The steak was delicious, juicy and tender, only seasoned with salt and pepper and a bit of garlic powder. We prefer our steaks rather basic, but I had some mushrooms to use up, so I sauteed them in butter with a bit of fresh thyme and covered the steaks. Yum! Dry steaks with paper towels, so that meat will sear better. Brush steaks lightly with olive oil. Season them with salt and pepper. Heat a heavy skillet over medium high to high heat. I used my cast iron skillet that is well seasoned. If you're not using a well seasoned pan, you made need to oil your pan with a small amount of oil or butter. Lay steaks in skillet, not touching. I cooked these about 4 minutes per side and they were very pink in the middle, just right for me. To test for doneness, you can use a meat thermometer. Stick it in the thickest part of the steak for a reading. If you've cooked enough steaks you can tell by touch. If the meat is soft it's rare. If it feels solid, it's probably well done. Of course you can cut into it too, to see how pink it is. Rare steak will register 120 - 125 degrees on a meat thermometer. Medium rare-130-135 degrees. Medium is 140- 145 degrees. Medium well is 150-155 degrees. Well done meat will be about 160 degrees, but since meat continues to cook a little after it come off the heat, you really should take it out of the pan early. Also, I think sirloin steak cooked until well done should be marinated, otherwise it tends to be dry and tough. I prefer steak cooked about medium doneness and it's usually tender and juicy at that point. After removing the steaks from the pan, let them rest a few minutes so the juices can settle. To cook the mushrooms, add 1 tablespoon of butter to either the same skillet, or another one, and add the sliced mushrooms. Add a pinch of salt and stir them around. As they release their juices, add some fresh thyme if desired and cook until the mushroom juices have evaporated. Serve over steak. 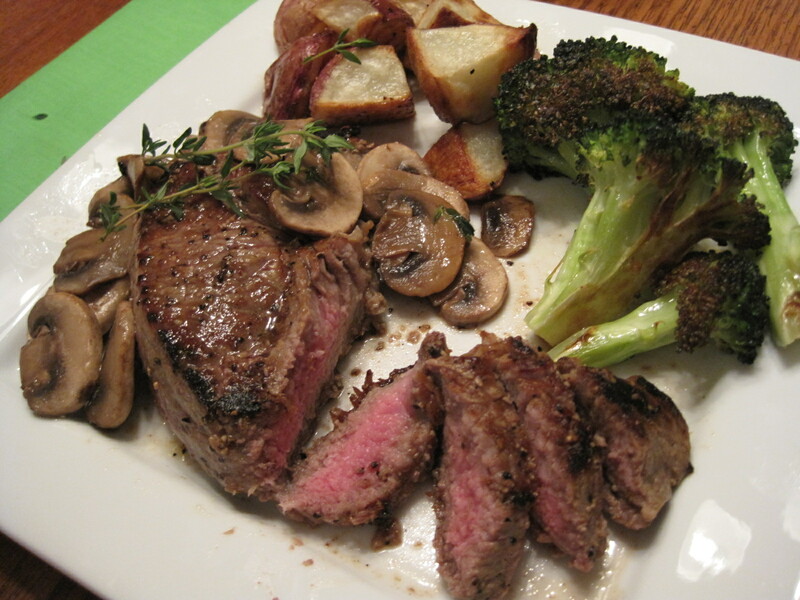 NOTE: Sirloin, New York Strips, T-Bone Steaks and other better cut of steaks can be pan fried. Cooking times will vary because of size and thickness, and whether or not there is a bone. I also served Oven Roasted Red Skinned Potatoes, and Oven Roasted Broccoli which I cooked on the same baking sheet. I cooked the potatoes in a 425 degree oven for about 25 minutes, and then added the broccoli and cooked another 10 minutes. Clean up was easy, which made me very happy! Have a wonderful week! It's pretty hard to beat steak and taters. Looks good from here. Looks like a perfect steak meal! Yum! I wish I saw that before dinner - had all the igredients and it does look scrumptious. After a weekend of salads, my family would have been up for your lovely steak dinner! I have begrudgingly pan cooked a few steaks but it requires some pretty serious outdoor weather to drive me to do that, lol. brussels calling!! What a prefect dish for my husband! He loves his steaks! I never eat cow's meat! But it surely looks so tasty! i am so motivate to try this recipe!!! the picture is gorgeous and IT seems pretty easy! So glad your steaks came out good and you stayed dry!.This is an easy way to enjoy a great steak-thanks for leaving a comment! We have the game on too here in Mo.